Do you know how to watch birds? How to really watch and enjoy our local bird population? 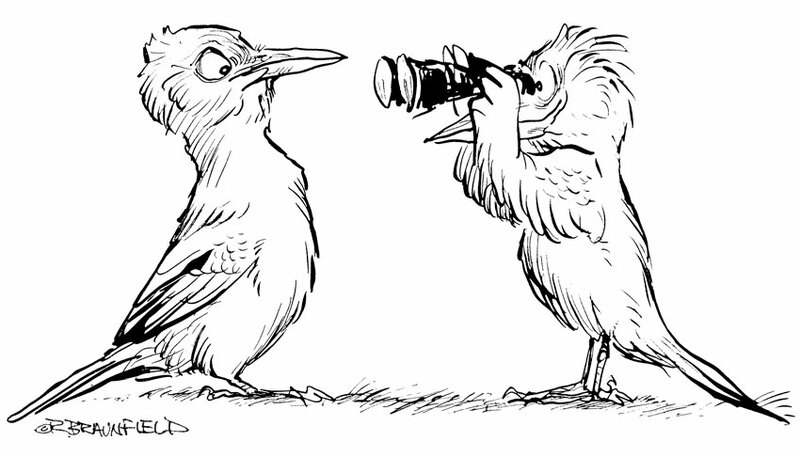 Then be sure to come to the Branford Land Trust’s April lecture “How to Watch Birds,” an illustrated and animated presentation by artist and naturalist Robert Braunfield on Wednesday, April 27, 7:00 p.m. The event is free and open to the public, and will be held at the Blackstone Memorial Library, 758 Main Street, Branford. You may already know one of Braunfield’s characters, the “Bowerbird” which advertises the store of the name in Old Lyme. His artwork and writings have appeared in many national publications and in exhibits as diverse as the Arizona Sonora Desert Museum, the Antiquarian and Landmarks Society of CT, Mystic Marinelife Aquarium, and Bloomingdale’s in New York City. Braunfield teaches bird watching classes, leads birding trips and has been involved in a number of conservation projects and research studies, including his 25-year Bluebird Nestbox Project, which has fledged over 5,000 Eastern Bluebirds in the Lyme/ East Haddam area, and his 20-year Breeding Bird Survey, conducted on 1,000 acres of property owned by The Nature Conservancy in East Haddam where he lived for 23 years. Braunfield’s bird sculptures in wood have won numerous awards and have been exhibited nationally. His varied interests have led him to judging the Connecticut finals of National History Day Competition, serving as Baked Goods judge at the Hamburg Fair, floor-managing Vintage Clothing and Textile Auctions in New York City, and even appearing as an extra on the TV show Saturday Night Live! His latest project is working on artwork for the sequel to a book he illustrated a few years ago, Good Birders Don’t Wear White, to be published by Houghton Mifflin this year. This is sure to be an interesting event. We look forward to seeing you! The mission of the Branford Land Trust is to preserve open space in Branford, and to promote our community’s appreciation of Branford’s diverse natural features. For more information about the BLT or its Winter/Spring lecture series, please call Martha Rice at 203-314-7128.